Between 1909 and 1915, Northcote W. Thomas, made hundreds of sound recordings as part of his anthropological surveys in Southern Nigeria and Sierra Leone. His recordings included stories, ‘specimens’ of languages, and especially samples of local music traditions. These wax cylinder records are now in the collections of the British Library Sound Archive – one of the [Re:]Entanglements / Museum Affordances project partners. The fragile wax cylinders have recently been digitized and we are working with the recordings in our fieldwork. Nandawa Kargbo, from Makankoi near Kamalo, singing a traditional Makama style Temne song accompanied by a ‘5 gallon’ (a five-gallon plastic container, replacing a bass drum). 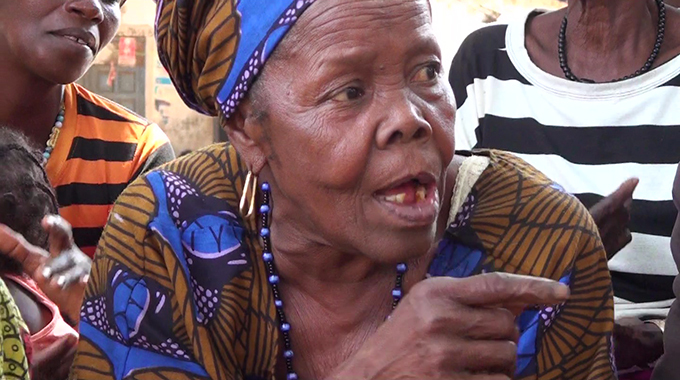 Nandawa sings Eye ye minɛ soli-o [I am worried], A tey mi thonɔŋ-o ka ȧŋwula [I am left in the wilderness], Eye ye I bayɛ sɔ wuni ŋȧsu abɛra I bayɛ su wuni ta mɔnɛ [I have no one left on my side, my fellow women, for the sake of poverty]. When we arrived unannounced in Sendugu one afternoon, we were greeted by a group of women singing and led by the oldest member of the community (the woman pictured above on the right). At the time of Northcote Thomas’s visit in 1914, Sendugu was the seat of the Paramount Chief, Bai Lama Munu. Since those days, however, the chieftaincy has been elsewhere. The song told of the return of power to Sendugu and the Munu lineage. The song included here has the words: A yɔ mi kare, ye [They wronged me], A yɔ kare ro rȧsu a yɔ mi kare [They wronged me by our people], Ye kare ŋa yemu, kare ka rȧbȧy-o [It is wronged, wronged by our leaders]. 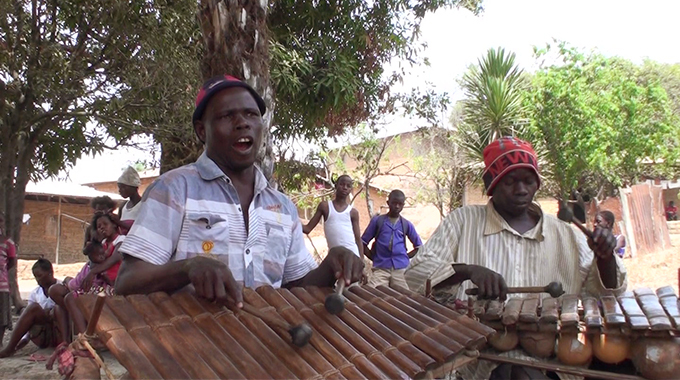 A Bundu society song performed by Digba Nasoko H. Turay, Matotoka. 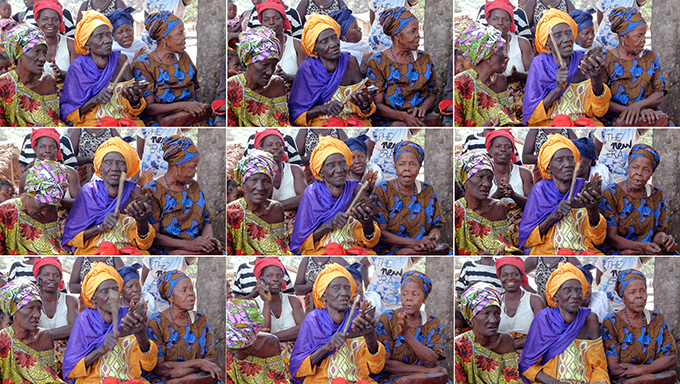 Accompanied by Bundu society women, saka (gourd shaker), saŋbori (Bundu drum), saŋgba (hour-glass-shaped drum) and ‘5 gallon’. The song is a warning to non-members to not interfere with Bundu society business. Digba Nasoko sings Yirȧ gbo əŋ kəli-o, Eya ye gbeleŋ bȧki yirȧ kəli-o [Sit and watch! Our elder sit and watch! 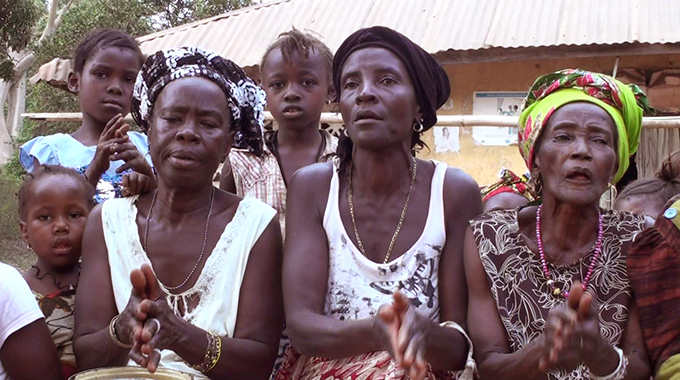 ], while the refrain, Gbenleŋ say, gbeleŋ kənəmla gbeleŋ say, is a Bundu chant that cannot be translated into ordinary language. The original location of Matotoka that Northcote Thomas would have visited is now the society bush and it is forbidden for non-members to visit it. 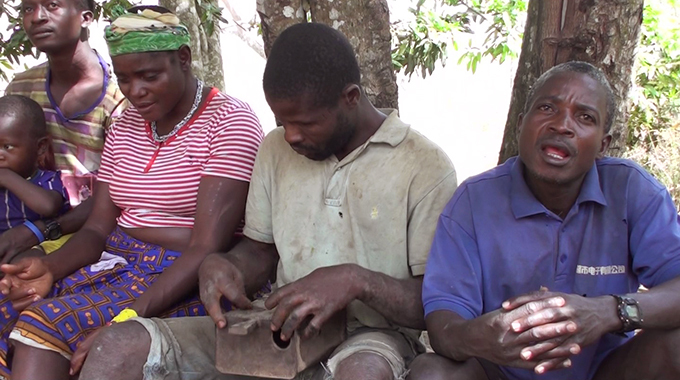 This beautiful song is sung by Tambah Koroma from Kolifaka, and recorded in Mabonto. Tambah accompanies himself on the kondene, a 10-stringed bow (somewhat like a kora). This is originally a Yalunka instrument played by hunters. Traditionally, the kondene‘s bow was inserted into skin-covered gourd, which acts as a sound box. These days a metal pan is often substituted for the gourd. Tambah is a well-known kondene player locally, though when we visited him in Kolifaka, he explained that he hadn’t played in a long time and he showed us his kondene in pieces with no strings. The following day, however, when Tambah met us in Mabonto he had completely restored the kondene. This is a Koranko song his grandfather taught him. It tells of the hunters’ prowess and their ability to attract women, since they could provide food. It was played to hunters to give them courage as they left for the forest and its many dangers. Northcote Thomas did not visit Bendugu, but he photographed a number of balaŋ players in Mabonto – praise singers of Paramount Chief Ali Suri. When we asked about local balaŋ players, we were told about Mohammed Gibateh in Bendugu, some hours drive away on very rough roads. 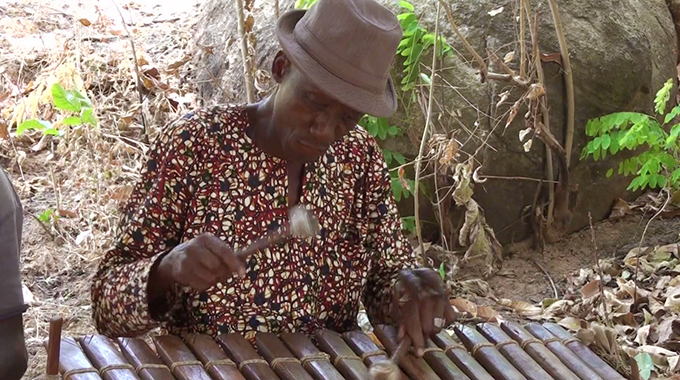 The balaŋ is a xylophone, traditionally associated with the Mandingo, Soso, Koranko and Yalunka areas of Sierra Leone. This recording includes two balaŋ one played by Mohammed Gibateh, the other by his brother Fassaleh Gibateh. They come from a famous family of Koranko praise singers (Yelibah). This song speaks of the value of life – even if one has nothing, if there is life, there is hope. If there is hope, there is life. A song led by Ma Binty Conteh welcoming us to Bumban. 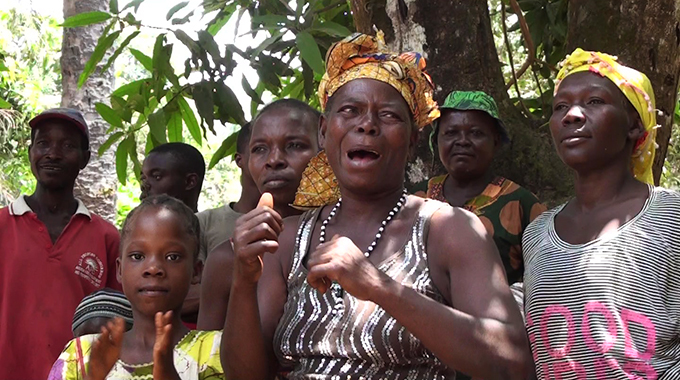 The song, sung in Biriwa Limba, expresses how the community is happy – someone has come to bring development to Bumban. 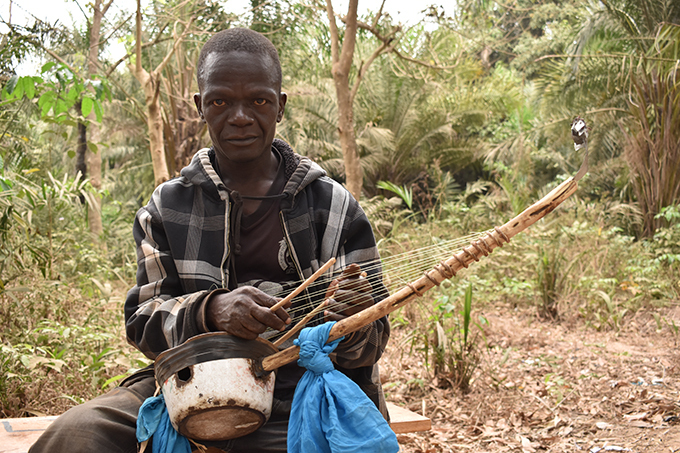 Mohammed Kuyateh is known as ‘Medo’ (‘the famous’), and is a well-known balaŋ player and praise singer in Kabala in north-east Sierra Leone. He is praise singer to the current Paramount Chief, Chief Gbawuru III, and his forefathers were praise singers to Chief Gbawuru I, who Northcote Thomas photographed in Kabala 1914. Thomas also photographed two balaŋ players in Kabala, including one called Fode, likely to be Mohammed’s grandfather, who was indeed named Yelli Fode. The first thing Mohammed did when we showed him this picture was count the number of ‘keys’ or gbene on the instruments – there were 15, while these days it is more typical to have more (Mohammed’s balaŋ has 18). Mohammed explained that the Yellibah always performs his songs in the Maninka language, regardless of what language he speaks normally. He is accompanied here by Salu Conteh on the bata (hour-glass shaped drum), and by his sons, Lansana Kuyateh (second bata) and Alusine Kuyateh (dundun or bass drum). Mohammed himself plays the balaŋ with a hand rattle or bell on one wrist. 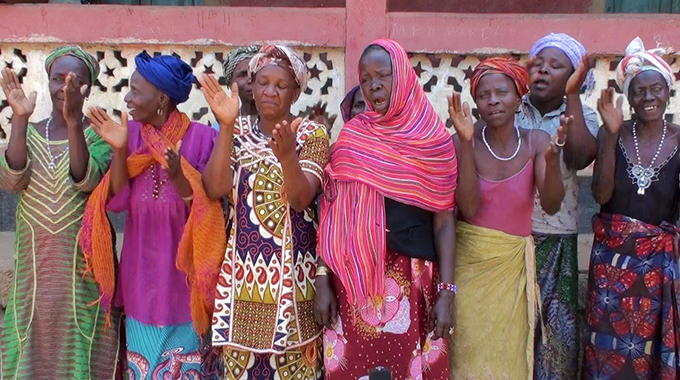 A Yalunka Bundu society song led by Sukaria Sigisa Samura. The women explained that this was one of their oldest songs, dating to the times of the great Yalunka chiefs. It was sung also as a demonstration of their pride in the women’s society, and in gratitude for our visit with photographs and recordings of their ancestors. Copies of these and other songs recorded ‘in the footsteps of Northcote Thomas’ will be deposited with the British Library Sound Archive. We are grateful for the British Library for supporting this aspect of our fieldwork. 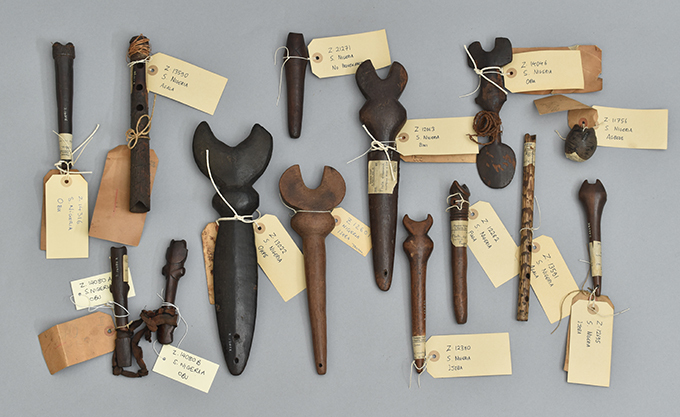 Flutes collected by Northcote Thomas during his anthropological surveys of Edo- and Igbo-speaking communities, Southern Nigeria, 1909-1913. (University of Cambridge Museum of Archaeology & Anthropology). During his anthropological surveys of Edo- and Igbo-speaking communities in Southern Nigeria between 1909 and 1913, N. W. Thomas collected and recorded a number of examples of local flutes. Thomas gives the Edo name for these as alele, elele or ulele (depending on dialect); he records the Igbo name as ọja. In the first volume of his Anthropological Report on the Ibo-speaking Peoples of Nigeria, Thomas notes that, next to the drum, the flute was probably the commonest musical instrument in the region; he also observes that there are ‘two or three kinds made of wood’, and another kind ‘made of calabash covered with the skin of a cow’ (1913: 136). Thomas distinguishes different styles of flute music, played in different contexts, for example during wrestling matches, during wall-making and while drinking palm wine (ibid.). 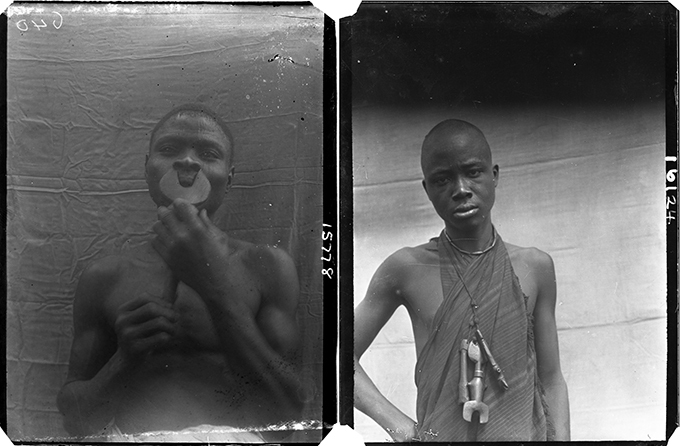 Left: ‘Man with flute’, Ijebba [Uzebba], June 1909 (NWT 640; RAI 400.15778); Right: man with three flutes strung around his neck, Agolo [Agulu], 1911 (NWT 2171; RAI 400.16124). Ọja is the most common of the wind instruments. It is made of wood, usually a light soft wood, and of bamboo. The wooden ọja is notched and end blown, while the bamboo ọja, also notched, is side blown. Of the two types of ọja only the wooden one has survived the changing times. The explanation of this survival can once again be found in its deep functionality in Igbo cultural and social life. The characteristic of ọja is the high-pitched sound which the different types produce. This is because this family of instruments is small in size. The biggest ọja discovered by this author is about 26cm long, and the smallest about 14cm long. The size of an ọja determines its pitch and the quality of sound determines the instrument’s function. The highest-pitched flutes, which are also the shortest, are known either as ọja-mmonwu (flutes used for masquerade music) or ọja-okolobia (flutes used for ceremonies of men who have attained manhood). The sound of both flutes is bright and they are used more for chanting than for singing. The difference between the two styles is that chanting is an extended form of speaking, while singing is purely musical. The lowest-pitched flutes are known as ọja-igede. Igede is a drum music used for burial ceremonies, and ọja-igede is used in pairs with the male ọja calling and the female ọja responding. The next ọja, whose sound is half way between the highest-pitched and the lowest-pitched ones, is known as ọja-ukwe (the singing flute). This is used for women’s dances of all types. Flutes collected by Northcote Thomas in Nigeria. Left: ‘Flute of camwood, Bini’, collected 1909-10 (NWT 55; MAA Z 12063); Right: ‘Flute (oja), Obu [Awgbu]’, collected 1911 (NWT 192; MAA Z 14046). As an instrument, it is fundamentally employed for performance-composition of melodies, as well as simulation of texts in music and dance performance situations. It provides lyrical melodies that contribute immensely to the overall timbre and aesthetics of Igbo music. In some musical performances oja effectively employed for non-verbal communication with ensemble members as well as the audience. This could be in the form of cues, musical signals or mere encouragement of dancers and players to a more creative performance. … In some instances, oja is employed as a master instrument that conducts and marshals or determines a musical event or performance form. This is found in some masquerade performances such as Ojionu. But, oja performs both musical and non-musical roles in Igbo land. Its use extends beyond the musical. It is employed in non-musical events and contexts as a talking instrument. As such it encodes significant messages within non-musical contexts. In such instances it conveys relevant messages to cognitive members or initiates in a a ceremony. It is, particularly, used for salutations and praise on these occasions. 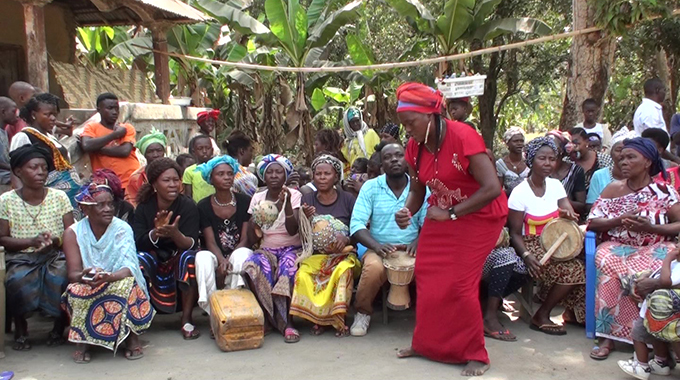 A number of videos of contemporary ọja players can be found online. Lo-Bamijoko, J. N. (1987) ‘Classification of Igbo Musical Instruments’, African Music 6(4): 19-41. Onyeji, C. U. (2006) ‘Oja (Igbo wooden flute): An Introduction to the Playing Technique and Performance’, in M. Mans (ed.) Centering on African Practice in Musical Arts Education (pp.195-208), Cape Town: African Minds. Thomas, N. W. (1913) Anthropological Report on the Ibo-speaking Peoples of Nigeria, Part 1: Law and Custom of the Ibo of the Awka Neighbourhood, London: Harrison & Sons.